Take a virtual field trip on your desktop, laptop, tablet or smartphone and join us for some great views of the local wildlife in the State of New Jersey, USA. You will see many deer -- bucks, does, fawns -- plus an assortment of squirrels, birds, raccoons, foxes and more. Whatever your wildlife interests, we hope you find something interesting to watch. Remember to review our automated snapshot gallery to see who's been visiting. PTZtv produce a growing number of live streaming scenic webcams which you can visit at the links below. 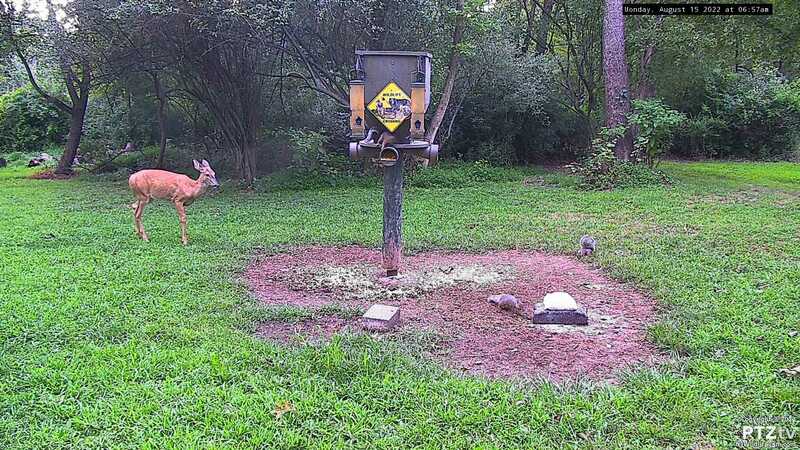 New Jersey Wildlife Cam content copyright © NJWildlifeCam.com and PTZtv LLC. All rights reserved. We are not affiliated with or officially endorsed by The State of New Jersey.